People of colour have lived in Britain for centuries. David Olusoga’s recent BBC2 documentary Black and British: a forgotten history powerfully documented the long relationship between the British Isles and the people of Africa. The NHS has a particular place in the more recent history of this complex relationship. On 22nd June 1948, the Empire Windrush arrived at Tilbury bringing many migrants from the West Indies. Britain’s post-war reconstruction needed their labour, and the newly-formed NHS actively recruited doctors and nurses from the Commonwealth over the following years. Immigration was, and remains, essential to the development of the NHS. One of the most compelling first-hand accounts of immigration to Britain comes from Nurse Shirla Philogène, whose first job in Britain was at Essex County. The biography makes for an engaging read, describing Shirla’s experience “between two worlds” of Saint Vincent and the United Kingdom, and also giving us access to an important story of life at Essex County Hospital. I would highly recommend this book – it is an inspiring read. People still come from around the world come to Britain to work in the NHS; the contributions that migrants make to our healthcare system are invaluable – it wouldn’t work without them. 2018 marks Essex County Hospital’s 200th anniversary but also 70 years since the foundation of the NHS and the arrival of the Windrush. There must be many more stories of people who, like Shirla, migrated to Britain and came to work at ECH – and we would like to be able to hear and share them. Over time, we hope to build up a record of people’s recollections as a lasting legacy of the hospital so please do send us a message on our contact form if you do have anything you would like to contribute. So far, we have read about the history of Essex County and its buildings from wonderful posts by Kyle and Deb, but why will the hospital be remembered? The people who worked there and the patients themselves give us the memories from the hospital and help it to live on. Using oral histories from the Colchester Recalled collection – a volunteer-run project gathering recordings from around the district – my post follows some of the staff who worked in the hospital in the 1960s. Rosina Eleanor Fisher started working at Essex County as a cleaner, but later joined the Preliminary Training School at the hospital, eventually qualifying as a Registered Nurse. She describes going to lectures on anatomy and physiology as well as being taught how to make beds. She learned how to bandage correctly, recalling that head bandages were especially difficult. During this time, she lived with other nurses in the Nursing Home that can still be glimpsed behind the iron gates on Oxford Road. Rosina started her nursing career on the surgical ward, remembering giving drinks to patients at two in the morning, as well as bathing the men on the ward. Rosina’s describes feeling ‘over awed by the hospital which seemed quite magical’ and the remembers the kind treatment she received from patients, who often treated her like a daughter. In her oral history, Rosina fondly remembers the social activities that happened on the hospital’s site, including the yearly fetes that took place on the lawn. Alan William Fredrick Fisher was the first man to become a Charge Nurse at Essex County Hospital, working around the same time as Rosina in the 1950s-60s. In his recording, Alan describes the busy wards at the Hospital and often reflects on the challenges of the wards which he worked on for six years. Like Rosina, he describes the patients accepting him as someone who could do the job, which made him feel confident in the role. Alan also highlights the changes that have occurred in the profession; he explains that nurses had to be single to work there and if they were married were often made to quit. Marguerite Jenkins was an outpatient receptionist at Essex County. She describes how women working at the hospital were given specific roles. She explains how it was a woman’s job was to write the names of all outpatients in a leather-bound book with copperplate writing, which, she reflects, would not happen now. Her memories are often quite dramatic as well as funny. She describes the experience as a medical officer of moving thousands of records from Essex County to Colchester General Hospital, which as you can probably guess was quite a task! Christmas brought pressure at work in the hospital, but also fun. Some of Marguerite’s fondest memories were the marvellous times that the hospital often had at Christmas. She describes how they built a stage in outpatients’ area, which would be used for carol-singing and to entertain the children. Christmas concerts could also involve doctors dressing up, even performing ballets, which Marguerite describes as being “great fun”. Marguerite also describes how the consultants would often visit each other’s houses for drinks around Christmas-time. These experiences show that, even in a stressful environment like this, the hospital could still be a place for patients and staff to have fun and to entertain. Rosina, Alan and Marguerite are only three of the former staff of the Essex County to shared their memories as part of Colchester Recalled, and there are many more recordings to explore. We hope that, as the hospital approaches closure, others will come forward. The buildings will remain, but we now need to capture the recollections of the people for whom the hospital was important, for today and for the future. 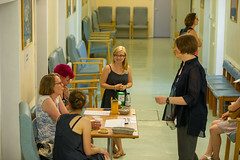 Amy Powis, a third-year History student at Essex University, has been working on the Essex County Hospital Heritage project over the summer as part of the Frontrunner placement scheme. Did you work at Essex County Hospital, maybe you were a patient? If so, we would love to hear from you, using the contact us form on our website. Following on from Deb’s brilliant blog post. 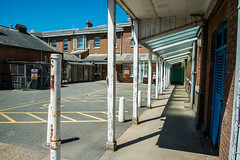 It seemed appropriate to further discuss some of the key buildings which really help to tell the story of the hospital. Perhaps the most iconic of the buildings is the main hospital frontage; it is probably the building that most people have in mind when they think of the Essex County Hospital. This is the earliest structure on the site, built in 1820. In 1825 it had a portico added, which includes neoclassical columns which stand proudly. It is, to this day, an impressive structure. It is a testament to the great care and importance that the hospital founders placed upon it. The nurses home today has long been out of use but the exterior of the extended building can still be viewed from Oxford Road. It gives a glimpse of the past to anyone walking by. We are still looking for more information regarding the sponsors, but we have already uncovered artefacts from this time including a poster promoting the laying of the foundation stone ceremony, which took place the previous year on 27th November and record cards which relate to individual sponsors, but not organisations. 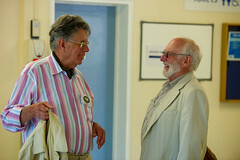 “In 1957 the Consultant in Radiotherapy was asked to undertake the treatment of patients from the Chelmsford group. This added burden was accepted partly to save the patients the additional suffering of travelling long distances and also in order to co-ordinate more closely the treatment of local patients near to their homes and families. It was also hoped that this would expedite the provision of the new Department. Now what of the future? The Radiotherapy department came at an interesting time in the hospital’s life. Admittedly, it may not be as iconic visually when compared with the other buildings. However, it is nevertheless a crucial part of telling the story of the hospital’s development. Both the embracing of new medical advancements as well as the new era of the NHS would allow for such investment and developments to be possible which the older, albeit noble, subscriber model simply could no longer provide. The NHS has undoubtedly left its mark on the Essex County Hospital. Most people nowadays are unlikely to remember it during the pre-NHS era. However it is still an iconic site that many can still appreciate with the varying styles and periods of architecture evident throughout. Prior to the early 1800s there were no general or voluntary hospitals in Essex. There had been a military hospital at the barracks in the heart of Colchester which had housed up to 500 soldiers who were injured or sick, but this closed following the end of the Napoleonic Wars. The War Office decided to sell off the barracks as lots, and so funds were raised by a small group of townsmen including the founder of the hospital, the Revd. Archdeacon Joseph Jefferson, to purchase the South Wing of the Military Hospital on August 12th 1818. “so humane and useful an Establishment be submitted and strongly recommended to the Public as a GENERAL INFIRMARY for the POOR” . Additional suitable land was later purchased in June 1819, and building work commenced with the foundation stone being laid June 18th 1819. The hospital, initially called the Essex and Colchester Hospital, formally opened its doors on September 14th 1820 with the first inpatients admitted a week later on September 21st. By the end of January 1822, the hospital had admitted its 200th inpatient, the majority of whom came from Colchester or from within a 15 mile radius of the town. In 1907 the hospital became the Essex County Hospital, a name it retains today. 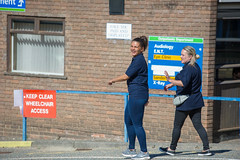 In recent years some of the functions of Essex County Hospital have moved to the newer facilities at the Colchester General Hospital which opened in 1984, and the old hospital will close next year in its 200th anniversary year. The site is being sold and it is due to be redeveloped. Essex County Hospital has been an important part of the Colchester landscape and of the town’s history. 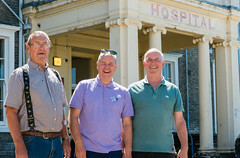 It is an institution which is held in great affection by many of those who worked or were treated there, and work is underway to preserve as much of the history of the hospital as possible before its doors close for the last time. Manager on the team leading the transfer of services from Essex County Hospital to new accommodation nearer the Colchester General site, aims to create an online resource which preserves and makes available to the public important and fascinating artefacts and records of life at the hospital across its 200 year service. 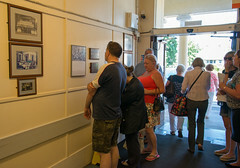 Many of the original features of the hospital remain in place, and in the first stage of the project, staff and postgraduate students from the University are documenting and photographing these original features which would otherwise be lost. Catalogues of old records and photographs are also being created which will be made available. The Project website has now been launched and we would like to invite you to visit the website to keep up to date with what’s happening. An Open Day is being planned for 2018 to celebrate 200 years of service provided by Essex County Hospital to the community, so please do look out for further announcements. Have you ever worked at the hospital, received treatment there or perhaps visited a patient there? Do you have any memories of the hospital that you’d like to share with us? 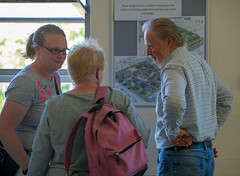 If so we’d love to hear from you so please do get in touch via email (echheritage@gmail.com) or via the contact form on the website (https://echheritage.org/contact/). 1 John B. Penfold, The History of the Essex County Hospital, Colchester: Previously the Essex & Colchester Hospital 1820-1948 (1984) The Lavenham Press, Sudbury, p. 2.